SEMCI INDIA is going to conduct the Nationwide Education and Scholarship Test (NEST). NEST exam is conducted for the purpose to ignite students’ interest in pursuing accurate knowledge and to prepare them for competitive skills, such as CAT, GATE, GRE, TOEFL and various other tests for admissions to higher studies in good institutes as well as for jobs in reputed companies. Nationwide Education and Scholarship Test (NEST) -2016 exam is scheduled to be conducted on 31st January 2016 (Sunday). Interested and eligible candidates can apply online or offline on or before last date: 30th September, 2015. Candidates can apply NEST Scholarship – 2016 NEST–I & II Scholarship Test form here. For more details like Eligibility, Certificates, Syllabus, Important dates and How to apply for 15th Nationwide Education and Scholarship Test – 2016 are given below. Nationwide Education and Scholarship Test (NEST) is a co-operative and collaborative effort to help out students who have commitment and determination and who display signs of excellence in their studies. SEMCI started with the business of organising events of all kinds in general, but with special focus on social and educational events. We have specialised in conducting diagnostic/projection tests for screening candidates to standardise the selection process for business organisations and educational institutions. NEST is especially designed to students’ ability and interests as are essential at this stage of their education. Moreover, they also get instant cash prizes of handsome amount and certificates of appreciation as incentives for their outstanding and exemplary performance in the test. 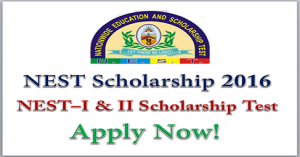 Nationwide Education and Scholarship Test (N.E.S.T.) for degree engineering students of all colleges and universities in India. Online or Offline Registrations are open for NEST-I-&II-2016 Scholarships for Degree Students of Science, Engg. & Medical courses, Final Year Dip. Engg & Class 12th (Science). For NEST-I : 10 or more scholarships of Rs. 30,000/- each with Rs. 75,000/- to Rank No. 1 in this Category. 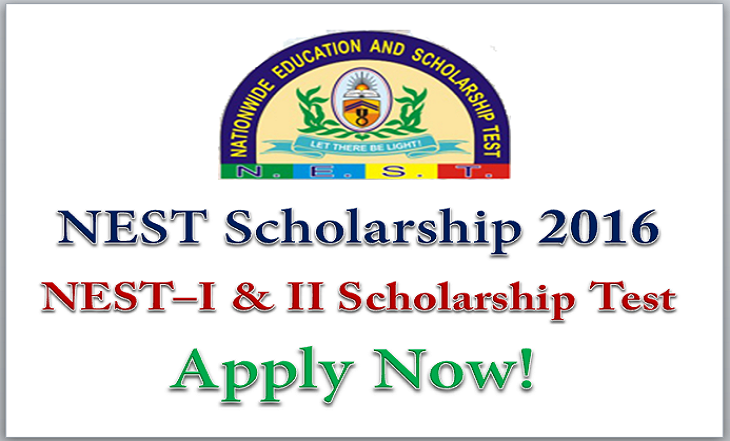 For NEST-II : 10 or more scholarships of Rs. 40,000/- each with Rs. 100,000/- to Rank No. 1 in this Category. Certificates of Appreciation shall be awarded to all candidates who score 40% and above in aggregate of all the five sections in the test. Rs. 600/- (Rupees Six Hundred only) till 30th September, 2015. Thereafter, there is late fee of Rs. 100/- till 30th November, 2015 & Rs. 200/- till 31st December, 2015. Rs. 700/- (Rupees Seven Hundred only) till 30th September, 2015. Thereafter, there is late fee of Rs. 100/- till 30th November, 2015 & Rs. 200/- till 31st December, 2015. NOTE: If you want last 6 years’ unsolved question papers of NEST, then add Rs. 300/- to the fee. However, the book is FREE for those who apply in July & August. In all State Capitals and other major cities of India, such as Agra, Ahmedabad, Amritsar, Aurangabad, Bangalore, Bhopal, Bhubaneswar, Chandigarh, Chennai, Coimbatore, Cuttack, Dehradun, Delhi and NCR, Dhanbad, Durgapur, Ernakulam, (Cochin), Goa, Guwahati, Gwalior, Hubli Hyderabad, Indore, Itanagar, Jabalpur, Jaipur, Jammu, Kolkata, Lucknow, Ludhiana, Madurai, Meerut, Mumbai, & Suburbs, Nagpur, Nashik, Panipat, Patna, Pune, Ranchi, Rohtak, Shimla, Trichy, Trivandrum, Vadodara, Vijaywada, Vishakapatnam etc. You can option for maximum two choices of cities in order of preference where you would like to take the test Except in a situation beyond our control, we will inform you about any such change in advance, at least 15 days before the test. The NEST exam is a objective type with Multiple Choice Questions (MCQs), Fill-in-Blanks and Yes/No types of questions as, for example, in CET, CAT, GATE, GRE, TOEFL, etc. Thus, any books that prepare you for these tests will also help you for NEST. Please find relevant study material yourself to prepare for this test. We do not prescribe any books on the subjects. How to apply online for NEST Scholarship 2016? Visit the official site which is www.nest.net.in. or open the direct link provided below. Search for NEST Scholarship 2016 and click on it. Fill the Application form online with the necessary details. Take the hard copy of form for further purpose. How to apply offline for NEST Scholarship 2016? The DD of the total amount must be in favour of “SEMCI INDIA” payable at Mumbai. Fill up the application form correctly and completely and paste your latest photograph in the space provided on it. Last date of submission of application form: 30th September, 2015. Late fee submission of Rs :100/- till 30th November, 2015 and Rs. 200/- till 31st December, 2015.